Join Landmarks, the public art program at The University of Texas at Austin, for a walking public art tour about the materiality of large-scale sculptures and the effect they have on their surrounding space. This will be the first opportunity to see and learn about Nancy Rubins' buzzworthy new "Monochrome for Austin" sculpture up close. 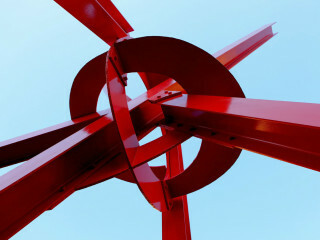 The tour begins at Mark di Suvero's "Clock Knot" (pictured to the right) near Dean Keeton Street and Speedway. For more information, email Landmarks.